The tech giants are all pushing their personal assistant platforms, each one powered by artificial intelligence and the ability to complete useful tasks. Voice search isn’t the future anymore, it’s the now – and it’s going to change search marketing as you know it. The rise of voice search hasn’t exactly been meteoric. It’s been a gradual progression since the likes of Siri and Google brought the technology to our smartphones – but things are now finally starting to take off. Google says 20% of mobile queries are voice searches while ComScore believes at least 50% of all searches will be voice orientated by 2020. By that time, platforms like Google Assistant, Amazon Echo, Microsoft’s Cortana and the other personal assistant apps will be a daily part of our lives. We’re now entering a new period where voice search becomes our first choice in a wide range of situations. Voice technology and the mobile web have already changed the way people search online. When users type queries, they tend to use the minimum amount of words possible – like ‘best restaurants London’, for example. But when people turn to voice search they’re typically using it in a more conversational way – like ‘which are the best restaurants in London?’. This has an obvious impact on the kind of keywords you’ll be targeting as voice search becomes more prominent. Long tail keywords will be the norm, but you’ll also have to think about the context of people’s search queries and the user intent behind them. That conversation may not look like much, but the user’s second question relies on Google’s ability to remember previous searches and interpret the context of future ones. Otherwise, it wouldn’t be able to understand what “it” means in the second query/command. Google is also known to be working on the concept of conversational shopping. So it won’t be long before you’ll be able to say things like “hey Google, order me a pizza” and wait for the doorbell to ring. From a search marketing perspective, voice search technology is going to change everything. We’ve already touched on the idea of conversational search, but the key for marketers is understanding what people want to achieve with voice search. The category that really stands out there is ‘Personal Assistant’ because these will be our interfaces to the web very soon. Google, Facebook, Apple, Amazon, Microsoft and a bunch of other tech giants are building their own gateways to the web and this alone will shake up the search marketing industry. The days of optimising for Google only are coming to an end and it will be interesting to see how the search provider handles the competition, after being the industry leader for so long. Google will also have fresh competition on the paid marketing scene too, as its rivals incorporate ads into their personal assistant platforms. Meanwhile, marketers will have a number of challenges to overcome. Instead of marketing for Google, it’ll be a case of marketing for Apple, Microsoft, Amazon, Facebook and any number of search platforms. It’s going to take some time as well, because there aren’t any proven marketing strategies for the likes of Microsoft Cortana. And there’s also the network of third-party locations businesses will need to be present on for each given platform. For example, Amazon taps into Yelp for its local listings while Google heavily prioritises its own local results. So the number of places your typical business needs to be present will continue to grow as each platform pulls in content from various sources around the web. The real challenge for marketers in a voice orientated web is turning conversations into conversions. People are using voice search in a different way and with different user intents, which means you need to rethink your approach to keyword targeting. Unfortunately, there aren’t many studies on voice search or tools you can use to get your hands on data. Google “hinted” last year that voice search reporting could make its way to the Google Search Console’s Search Analytics report but nothing has materialised as yet. In the meantime, you’ll have to take the responsibility yourself to build as much research on the kind of voice queries your target audiences will put to search engines. This isn’t something you want to wait around for either – voice search is taking off now and the brands that understand user intent first will be the big winners. 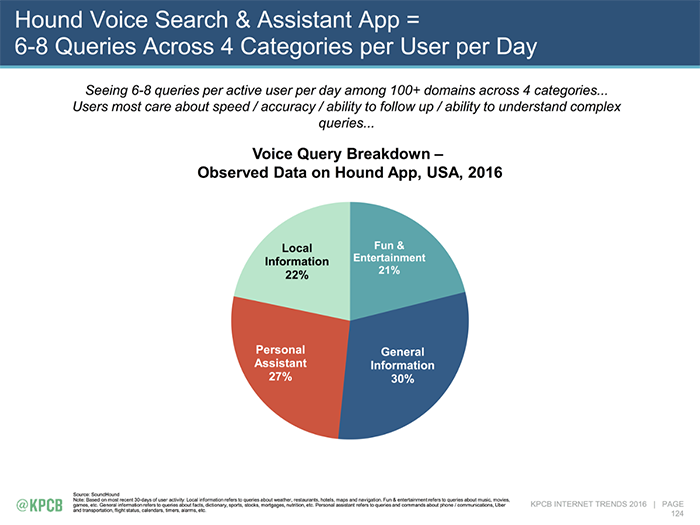 A key factor in user intent with voice search is the location independent factor. With devices like Amazon Echo, we’re reaching a point where we can search anywhere, without our phones or any other device in our hands. Soon we’ll be voice searching in our kitchens, bathrooms, offices, cars and elsewhere by simply calling out to our favourite app. Experts have long said that voice technology will replace typing and future devices won’t need touchscreens or displays in the way we’re used to. 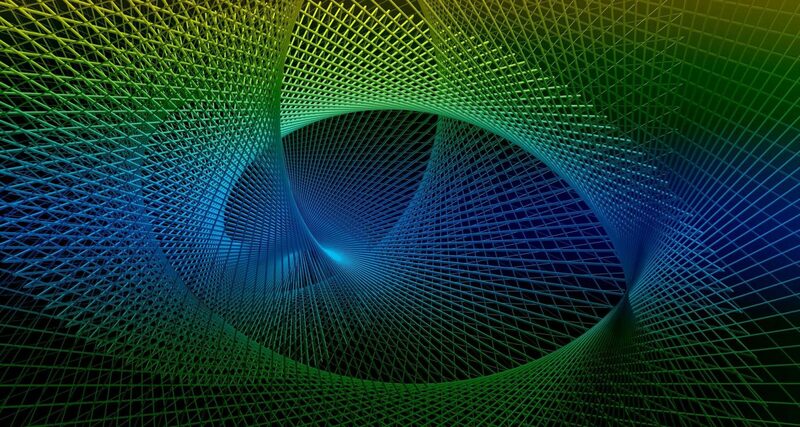 The future web will be hands-free, voice-activated and truly mobile. Voice search is going to change the nature of marketing, for sure. Brands need to get ahead of the game and start building up a picture of what their target audiences will be doing when voice technology surrounds them and which platforms they’ll be using. It’s going to be some time before there are enough studies and data on voice search to rely on third-party sources and by that time you’ll be at a major disadvantage. So start building your own data sets now and keep an eye on what the tech giants are up to – because your voice optimised content will need to be discoverable to their constantly evolving platforms. Companies that start thinking about voice search now will be the ones that prevail. Talk to us today about how you can start preparing – our own platform Apollo uses voice technology so we’ve lots of expertise in-house. Call 023 9283 0281 or submit your details here and we’ll call you. Last year, we got a taste of what to expect from the future of conversational UI, but 2018 is the year things will really take off. With Apple and Facebook poised to release their own voice-powered smart speakers in the coming weeks and months, this will be one of the biggest marketing trends of 2018. What does Google’s voice search transition mean for SEO? Google is en route to accommodating more voice queries. While the index remains mobile-first for now, the search giant is actively transitioning towards favouring the new kind of search experience – the Spoken Search Paradigm.